attends an Exclusive Reception for Digital Revolution showing at Barbican Centre from 3 July through to 14 September 2014 #digitalrevolution on July 2, 2014 in London, United Kingdom. In Andrea Fraser’s richly satirical video Little Frank and His Carp (2001), we see the American artist walking around the interior of the Guggenheim Museum Bilbao listening closely to the institution’s audio guide. The somewhat patronising voice she hears through the headset explains that the complex, intricate forms of this much-acclaimed building, designed by the Canadian architect Frank Gehry, are a recognition ‘that modern art is demanding, complicated, bewildering’. Just as Fraser starts to look anxious about the burdens that a visit to the Guggenheim may entail, she is reassured by the audio guide: ‘the museum tries to make you feel at home, so you can relax and absorb what you see more easily’. She beams in response, comforted to learn that she is in a safe and homely environment committed to her wellbeing. 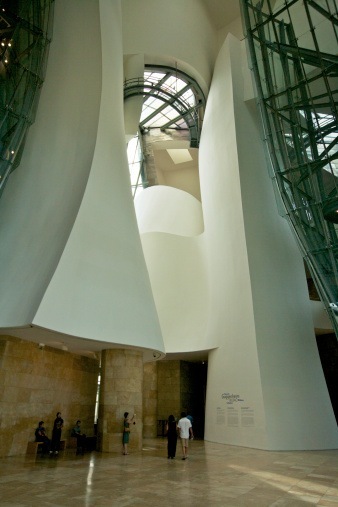 In fact, Fraser’s particular way of making herself at home in the Guggenheim is to rub herself against the curving columns of the atrium, an interaction with Gehry’s architecture that attracts a startled response from fellow visitors. It is a comic performance, but one that highlights some broad and vital questions concerning the experiences provoked by today’s museums and galleries. What forms of attention and distraction do institutions now try to stimulate in their visitors? Should we feel relaxed or bewildered when we encounter art? And how might notions of ‘interactivity’ and ‘participation’ – so often promoted as ways of engaging and enlarging audiences for art – clash with other states of absorption or reflection? Visiting a gallery or museum today often means encountering an immense array of devices, media and potential experiences, all of which compete for our attention. Alongside wall texts, exhibition booklets and audio guides, institutions now routinely offer interactive computer kiosks and video displays. Visitors are encouraged to download apps for further commentary and to contribute their own views to virtual comment boards. At last year’s ‘Culture:City’ exhibition at the Berlin Academie der Künste, each visitor was given a personal tablet computer and headphones to watch videos and access extensive digital content as they walked around the objects located in the gallery itself. 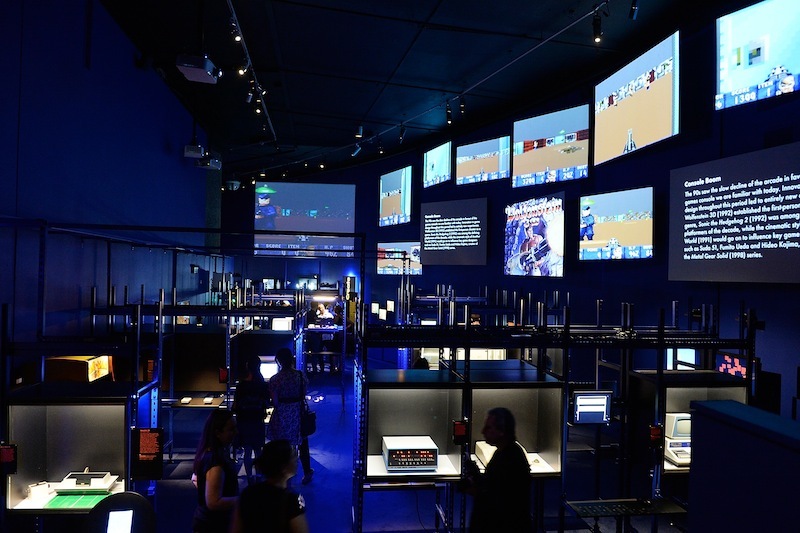 In London, the Barbican’s ‘Digital Revolution’ show (2014) included multiple games consoles and software programmes for visitors to enjoy, as well as artworks in which the movement and physical interaction of visitors were crucial constituents. This is by no means a trend limited to galleries displaying contemporary art or technology. At the refurbished Mauritshuis in The Hague, which reopened in June 2014, visitors are encouraged to ‘dive deeper’ into the Golden Age of Dutch art via their smartphones, thanks to a new app offering photographs, films and supplementary information on the museum’s collection. Films, sound recordings and touchscreens also feature heavily in the Medieval and Renaissance galleries at the Victoria and Albert Museum in London. On the one hand, such innovations clearly open up the possibility of new approaches to the objects or artworks on display. They acknowledge that people find meaning within galleries and museums in a variety of ways, and that our understanding or enjoyment of exhibits can be heightened through a range of media. The primacy of the visual in the gallery has increasingly been challenged through the introduction of aural, sensual and immersive elements. In her recent book Museums in the New Mediascape (2014), Jenny Kidd suggests that interactive displays are often valued by visitors for the novelty of engaging with new technology and for the break they provide from the reading and looking associated with exhibitions. Yet, as Kidd asks, if this ‘experience’, rather than the content of interactive displays, is what is deemed most important by visitors, is that enough to justify what is often a significant cost? There are other considerations in play here, too. The opportunity for absorption in the gallery, as promised to Andrea Fraser at the Guggenheim Bilbao, is not necessarily an outcome of highly mediated environments. Indeed, constant appeals for our interaction, stimulation and participation seem liable to provoke anxiety as much as pleasure or contemplation. That a heightened sense of ‘missing out’ now characterises contemporary life is an idea that has been explored by writers such as Adam Phillips and Renata Salecl, among others. When choices proliferate, when interactive screens and calls for participation are a constant presence, we may feel more alienated by a space than absorbed in its displays. We should question, then, whether the additional devices now found in galleries and museums pull us towards objects or distance us from them. An appreciation and understanding of certain works – those that are demanding, complicated and bewildering, in particular – may suffer in an environment where instant and interactive forms of engagement are privileged. A further factor shaping our attention in today’s galleries is the architecture now favoured by many institutions. In his 2011 book The Art-Architecture Complex, the theorist Hal Foster argued that the spectacular designs employed by many high-profile architects tend to produce a ‘stunned subjectivity’ in those who experience them. Buildings such as Gehry’s Guggenheim Museum and Jean Nouvel’s Fondation Cartier pour l’Art Contemporain in Paris, images of which operate within a fiercely competitive global market for art tourists, are full of special effects and remarkable forms, but the spectacle they embody may remove a certain level of agency from visitors. There is a risk that we become awestruck in their presence, mesmerised by an architectural flourish and distracted from the objects and artworks that the buildings house. When a museum is a mere spectacle offered for our consumption, docile wonderment (recall the grin on Fraser’s face) rather than engaged attention is likely to define our journeys through the exhibition rooms. Perhaps only works that are as vast and overwhelming as Richard Serra’s sculptural installations can compete with Gehry’s architecture in Bilbao. Quieter, more intimate and less immediately striking works may not fare so well in such surroundings. If the architecture of today’s museum often seems keen to seize our attention before we even reach its exhibits, it is partly because such institutions are now firmly embedded within an ‘attention economy’ – that is, an economy in which our attention is a commodity, something to be fought over and grasped for at every step. Shadowing the spectacular architecture and relentless calls for activity at many institutions is the fear that we may turn away at any moment – that our attention is so scarce and fleeting it could easily be lost without a screen to touch, an astonishing engineering feat to admire, or the chance to offer our own opinion. This is understandable in a funding context in which institutional success is measured mainly by visitor numbers. As a consequence, a very narrow form of attention is often promoted in today’s galleries, with other modes of spectatorship condemned as passive, limited or anachronistic. To pause or ponder, to simply sit or stand in front of a work of art for an extended period of time – without additional media – can now seem like a rare and radical act. In striving for an interactive gallery, other ways of understanding and enjoying art may have been neglected or made impossible. What makes the developments in interactive museum design even more intriguing is the simultaneous growth of participatory art in recent times. Human interactions lie at the heart of ‘relational aesthetics’, a term coined by the French curator Nicolas Bourriaud to describe artistic practices that develop from a social context. Informing a diverse range of work by artists such as Jeremy Deller and Thomas Hirschhorn has been a strong belief in the power of collaboration and public participation. As Claire Bishop has documented in detail in her study Artificial Hells (2012), participatory practices have grown exponentially across the globe from the 1990s onwards. Audiences have become central to the making and meaning of works, and institutions have become especially eager to commission works that involve visitor participation. 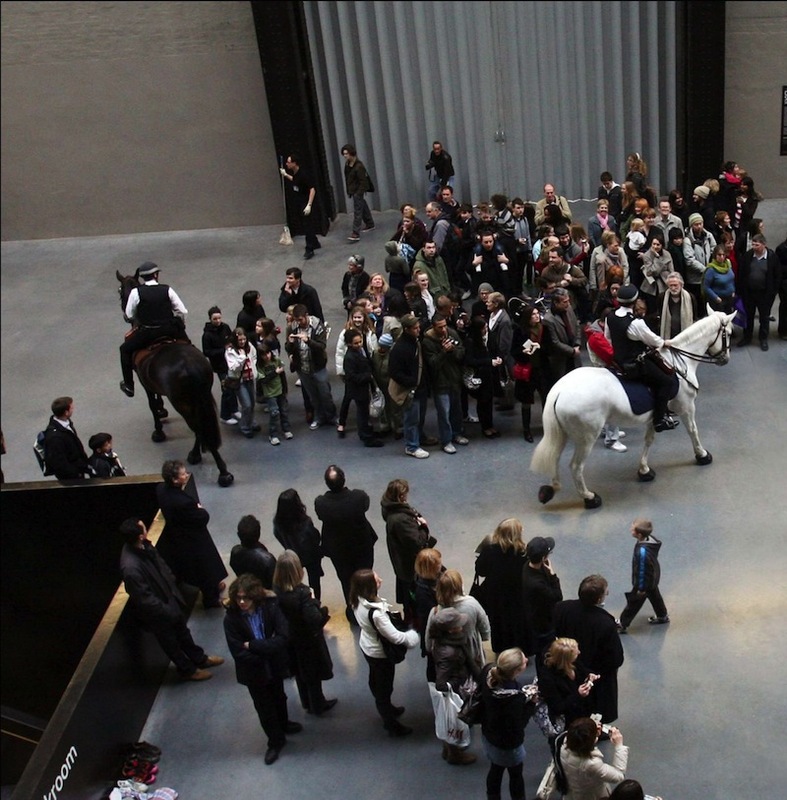 Take Tania Bruguera’s Tatlin’s Whisper #5 (2008) and Tino Sehgal’s These Associations (2012), both staged in the Turbine Hall at Tate Modern: in the former, two police officers on horseback performed (without announcement or explanation) crowd control techniques on visitors to the gallery, while in the latter work 70 trained volunteers offered stories and observations whilst walking through the audience. A sense of playfulness often attends such works, or as Foster has put it, in less positive terms: ‘contemporary exhibitions often feel like remedial work in socialization: come and play, talk, learn with me’. that paintings or sculpture may find hard to match. In this light, the gallery takes on a critical political importance. At a time when other civic institutions, such as public libraries, are struggling for funding, and when traditional public spaces, like the town square or the high street, have seen their status decline, the gallery’s role as a communal meeting point, a place of social exchange and collaboration, appears to be more vital than ever. However, this rather neglects the fact that many participatory works seek to highlight forms of social conflict, rather than stressing benevolent and wholly positive notions of participation and collaboration. Deller’s The Battle of Orgreave (2001) famously brought together – and not for therapeutic purposes, as the artist stressed – former miners and historical re-enactment societies to restage a confrontation between miners and police that originally occurred in 1984. Bruguera’s Tatlin’s Whisper #5 also raises complex questions about police violence and the social acquiescence that often follows methods of control and repression. Meanwhile, Andrea Fraser’s public performances epitomise a form of institutional critique that prohibits an easy absorption of art, and reassesses the casual interactivity offered by museums. All of which suggests we might have to ask some difficult questions ourselves about what we want from museums and galleries today, and whether the diverse demands placed upon them can possibly co-exist. Perhaps museums of the future should be more confident in offering different kinds of spaces for different kinds of experience. Beyond the benefits of participation and interactivity – and the technologies that may support them – there may be other ways of being that we want to provoke in a museum, if institutions are brave enough to support them. Do museums now dare to risk boredom, for instance – an emotional state that holds its own creative potential? Might museums again fulfill a role that many curators, critics and visitors have long valued, and become a haven – a place where constant cultural demands for interactivity and participation are disrupted, and contemplation and reflection are emphasised instead? If so, different curatorial strategies and alternative architectures may be necessary.